China has imposed a security lockdown in Tibet and surrounding areas, dispatching paramilitary police and armed forces in anticipation of possible unrest ahead of the 50th anniversary of the Dalai Lama's flight into exile. Heavily armed Chinese paramilitary police patrol a street of Kangding, Ganzi prefecture of southwestern China's Sichuan province on Monday. ((Ng Han Guan/Associated Press))China has imposed a security lockdown in Tibet and surrounding areas, dispatching paramilitary police and armed forces in anticipation of possible unrest ahead of the 50th anniversary of the Dalai Lama's flight into exile. "To address stability protection in Tibet, we have deployed troops to strengthen controls along the Tibetan [international] frontier at points of entry and on key sectors and roads," Fu Hongyu, commissar of the Ministry of Public Security's Border Control Department, told the state-run Xinhua news agency. 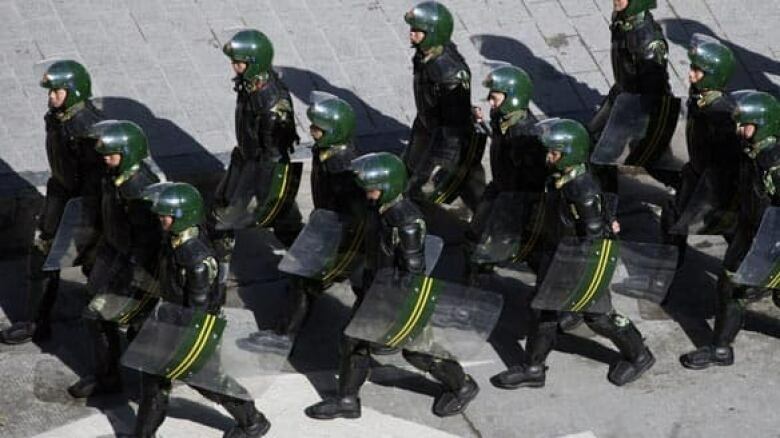 The CBC's Michel Cormier, reporting from Beijing, confirmed that there is a large police and military presence in Tibet and neighbouring provinces. It is unknown exactly how many troops have been deployed in anticipation of unrest that could come in conjunction with Tuesday's anniversary. In March 1959, Tibetan separatists began an unsuccessful revolt against Chinese rule. On March 10, the Dalai Lama, Tibet's spiritual leader, and 80,000 of his followers fled for India, establishing a self-proclaimed government in exile there. That uprising came nine years after what Tibetans say was an invasion of their country and the Chinese term a push to liberate Tibetans from serfdom. This month also marks the one-year anniversary of massive anti-government protests that spread across Tibetan areas in China following a deadly riot in Lhasa on March 14. China says 19 people were killed in those riots, most of them ethnic Han Chinese. The Tibetan government in exile puts that figure as closer to 200. Many of the monks involved in that protest have had to take what China calls political re-education classes and were compelled to renounce the Dalai Lama. China has also started a media campaign on the Tibet issue, said Cormier. The government has begun airing documentaries on television this month outlining the Chinese point of view. "The Chinese government has obviously decided that they would not be caught by surprise like they were last year with this uprising and have decided to do everything they can to prevent any unrest this year," said Cormier. "For weeks now, we've heard that they've been putting under house arrest people who may want to demonstrate — monks also." China has said it doesn't expect unrest ahead of the anniversary. "It's my understanding that now Tibetan society is extremely stable," Kang Jinzhong, Communist Party commissar of the Chinese People's Armed Police in Tibet, told Xinhua. "As the armed police, we have the ability to deal with any situation as it arises." Kang, speaking in Beijing on Monday, where he was attending the annual national parliament, said "hostile forces ... may be preparing to make some trouble, but their scheming will never succeed." The same day, Xinhua reported that a police car and fire truck were hit with two homemade bombs in a protest in a western Chinese province. Xinhua reported that the Sunday protests were a result of a confrontation between locals and police in the Golog prefecture in Qiinghai province. There were no fatalities, Xinhua reported. The news agency identified the protesters as Tibetans.